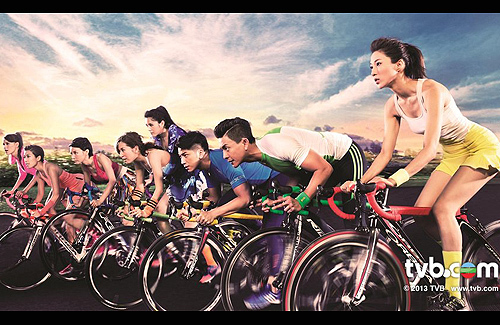 TVB unveiled its 2014 calendar last week, featuring its top stars in the sports-themed photo shoots. The calendar theme was inspired by the upcoming 2014 FIFA World Cup Brazil, in which TVB will hold exclusive broadcasting rights. As Hong Kong residents are known to be passionate fans of the World Cup, TVB decided to showcase its artists’ vitality and energy in a different highlighted sport for each month. The 2014 TVB calendar saw the return of the station’s icons such as Liza Wang, Carol Cheng, Eric Tsang, Nancy Sit, and Wayne Lai, as well as veteran stars, established stars, and more youthful rising artists. This is ridiculous, it’s like playing “who can you spot in the crowd”. It used to be that only the top band of actors and actresses made it on the TVB calenders, where they had pairs for each month. The good old days where you had Husuan Jessica with Louis Koo, Kenix Kwok with Gordan Lam. Not any random third or fourth line actor could be on it. Now they cramp everyone in and the big names are lumped with other crappy actors. Boo.